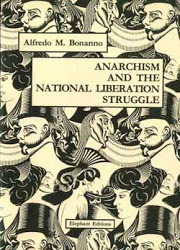 Notes: First English edition published 1976 by Bratach Dubh anarchist pamphlets. An objection to this could be that the State discriminates in this way between two bourgeois groups: the industrialists of the North and the landowners of the South, but to understand this we must bear in mind the different possibilities of exploitation between a highly developed and an underdeveloped area. In the South a 12–14 hour day was normal while the eight hour day had already been gained in the North. It is in this way that, thanks to the various advantages of a still medieval conception of society, the Southern landowners continued to extract surplus value without much reinvestment. Thus the development of the North was guaranteed through the exploitation and enslavement of the South. The political rule of the North dictated this direction. which then took the course of capitalist production in general. Integration into the Italian capitalist system produced a disintegration of the Sicilian economy which in many aspects is of a pre-capitalist type. The law of the market obliged the most backward regions to integrate with the basic capitalist system: this is the phenomenon of colonisation, which comes about in foreign regions or nations, as well as in the internal regions of single capitalist States. Marx-Engels: In the pan-Slav manifesto we have found nothing but these more or less moral categories: justice, humanity, freedom, equality, fraternity, independence, which sound good, but which can do nothing in the political and historical field. We repeat, not one Slav people—apart from the Poles the Russians and perhaps the Turkish Slavs—has a future for the simple reason that all the other Slavs lack the most elementary historical, geographical, political and industrial bases. Independence and vitality fail them. The conquerors of the various Slav nations have the advantage of energy and vitality. In fact, the Marxist movements for national liberation, when ruled by a minority who eventually transform themselves into a party (a generalised situation at the present time), end up using strategical distinctions, leaving the essential problems—which in point of fact also influence strategy—in second place. A fatherland represents the incontestable and sacred right of every man, of every human group, association, commune, region, and nation to live, to feel, to think, to want, and to act in its own way, and this manner of living and feeling is always the incontestable result of a long historic development. There is nothing more absurd and at the same time more harmful, more deadly for the people than to uphold the fictitious principle of nationality as the ideal of all the people’s aspirations. Nationality is not a universal human principle: it is a historic, local fact which, like all real and harmless facts, has the right to claim general acceptance. Every people and the smallest folk-unit has its own character, its own specific mode of existence, its own way of speaking, feeling, thinking, and acting; and it is this idiosyncrasy that constitutes the essence of nationality, which is the result of the whole historic life and the sum total of the living conditions of that people. The dignity of every nation, like that of every individual, should consist mainly in each accepting full responsibility for its acts, without seeking to shift it to others. Are they not very foolish, all these lamentations of a big boy complaining with tears in his eyes that someone has corrupted him, and put him on the evil path? And what is unbecoming in the case of a boy is certainly out of place in the case of a nation, whose very feeling of self-respect should preclude any attempts to shift the blame for its own mistakes upon others. Every one of us should rise above the narrow, petty patriotism to which one’s own country is the centre of the world, and which deems itself great in so far as it makes itself feared by its neighbours. We should place human, universal justice above all national interests. And we should once and for all time abandon the false principle of nationality, invented of late by the despots of France, Russia and Prussia for the purpose of crushing the sovereign principle of liberty. Nationality is not a principle: it is a legitimate fact, just as individuality is. Every nationality, great or small, has the incontestable right to be itself, to live according to its own nature. This right is simply the corollary of the general principle of freedom. The attempt to replace man’s natural attachment to the home by a dutiful love of the state—a structure which owes its creation to all sorts of accidents and in which, with brutal force, elements have been welded together that have no necessary connection—is one of the most grotesque phenomena of our time. The so-called “national consciousness” is nothing but a belief propagated by considerations of political power which have replaced the religious fanaticism of past centuries and have today come to be the greatest obstacle to cultural development. The love of home has nothing in common with the veneration of an abstract patriotic concept. Love of home knows no “will to power”; it is free from that hollow and dangerous attitude of superiority to the neighbour which is one of the strongest characteristics of every kind of nationalism. Love of home does not engage in practical politics nor does it seek in any way to support the state. It is purely an inner feeling as freely manifested as man’s enjoyment of nature, of which home is a part. When thus viewed, the home feeling compares with the governmentally ordered love of the nation as does a natural growth with an artificial substitute.